I have never felt disappointed by anything produced by Sacred Fools. High praise? Yes, but also extra pressure. Rose and the Rime by Nathan Allen, Chris Matthews and Jake Minton emerged from the same process that created another awesome bit of mythic theatre, Sparrow. Regular readers of this vlog might feel clued in to the use of the world "mythic." Yeah, this one is that good. That (dare I say it?) magical. "Rime" seems unfamiliar, doesn't it? It consists of granular ice tuffs left on the windward side of objects exposed to the wind. Without going into great detail--no matter the warning above--this word turns out especially apt. One of the central characters emerges as The Rime Witch (Desiree Mee Jung), who holds captive the town of Radio Falls in a never-ending winter. As the town name suggests, we have here no quasi-medieval village but what seems like a modern American small town. Or maybe a timeless modern American small town. Not really a contradiction. A paradox certainly. Certainly a piece of irony. Immediately as the play begins, we meet Rose (Amy Rapp) who will be the heroine. We know this because in classic fashion she befriends and talks with wild animals--just like Cinderalla, like Psyche, like many a hero in fairy tale. Rose learns the truth of why her town never knows summer, how the Rime Witch killed her parents. Her uncle Roger (Andy Hirsch) tells her this, and her resolution immediately grows. A brave child is Rose, the only child in Radio Falls. She follows the storm to seek to defeat the Rime Witch and bring summer back! She succeeds. You saw that coming, didn't you? What maybe surprises is this--even though summer returns, and this happy brave child has won the witch's power, the story is nowhere near over. For all practical purposes it now begins. For winter must follow summer. History repeats itself. Inside every happiness contains the seeds of future misery, just as catastrophe brings with it hope for change and a better tomorrow. How could it not? At least, until we find a way to break the cycle. There--in that idea--Rose and the Rime really sank into my bones. Preparing this review I intended to point out what looked like a weakness, a certain plot turn which seemed unjustified. Yet the more I thought on it, the more I examined the story in greater detail, diving into implications. That plot point proved the key to the central mystery of the whole piece. What exactly did the characters do wrong? They didn't tell the truth. Not to Rose. Not to themselves. Nor each other. Without that, how can they break the cycle? How can anyone? Will they tell the truth this time? None of this would work without the cast, who together under the direction of Jacob Sidney created this amazing world out of a dream, a dream full of prophecy and meaning. Upon a set designed by Hillary Baumann, they wove together a world of puppets (thank you Miles Taber) and combat (Andrew Joseph Perez) and dance (Sierra Taylor). Everyone deserves praise for this--Brian Brennan, Corinne Choeey, Sean Faye, Aaron Mendelson, Mandi Moss, Allison Reeves, and Bart Tangredi. This play opened on a day very hard for many of us, a day of nightmarish fears and a need for hope. Together you gave the audience the ritual of hope, of understanding and wisdom needed in hard times. 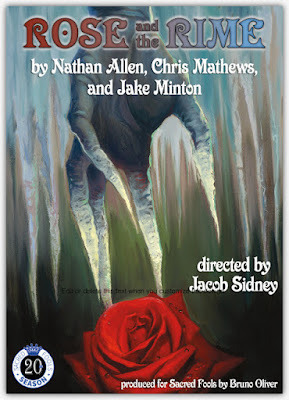 Rose and the Rime plays Friday and Saturday nights at 8pm through February 2, with 3pm matinees on Sundays February 12 and 19 at Sacred Fools Mainstage, 1076 Lillian Way (near Santa Monica and Vi ne) Hollywood CA 90038. An aging mafioso, not one of the big guys but on the other hand not small potatoes either, goes into work. He's maybe the last of a his breed. He cannot move too easily. Needs a hearing aid. Doesn't understand cellphones much less smart ones. Plus his wife is sick so he has to keep in touch. And on this day there's a problem, one getting worse as this old man has so many balls to keep in the air, so many obligations to answer, some many issues looming from every direction. 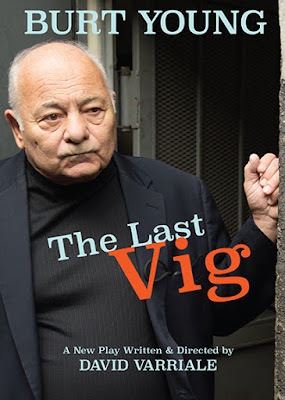 The Last Vig, starring Burt Young (probably best known as Rocky's brother in law, but with a much longer career than that one role) tells the tale of Big Joe. His office is behind a Chinese restaurant in Manhattan, where his very young assistant (Ben Adams) runs errands for him. The owner of the restaurant (Clint Jung) runs interference for him, as much as he can. 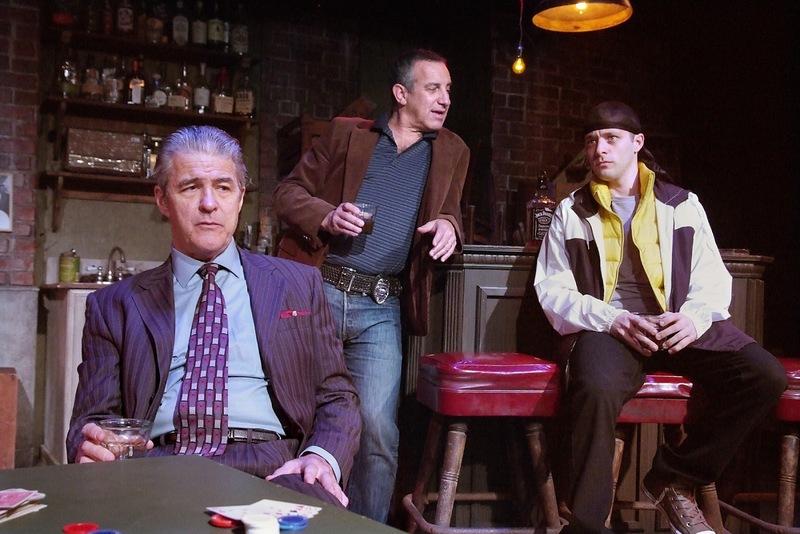 We learn as the play goes on of a very serious problem, one involving poker chips and a powerful Don in New Jersey. Joe gets an old friend of his (Gareth Williams) to help out. But Joe's wife (Lizzie Peet) is sick back at home with the gout, worried about their daughter and grandson. Joe tries to help out. Then, a crooked cop (Bruce Nozick) noses his way into this brew. It makes for a slow burn as far as drama goes, but an involving one. Like many a drama focusing on professional criminals, The Last Vig involves our emotions, diffuses disturbing little details with humor and moments of humanity. The actors do a uniformly fine job, with Young setting the tone. He shows the audience an admirably vivid performance, yet remains low key. From stillness the man conveys tension, no small feat. The rest of the cast follow suit, not simply as followers but showing considerable personal talent and skills (I've seen Williams before, where he proved this). Felt more like a movie than a play. I'm not saying the play doesn't work as a play. Not at all! The first act was a little low energy, but after intermission I was eager to see more so clearly that "low energy" did its job. But I kept wanting something. After eventually my mind, towards the very end, told me what was missing. Camera angles. It doesn't feel like a play where things naturally happen in a genuine real space. A need for focus emerged. Not a compelling need, nor anything that ruined any of the humor or defused a drop of the drama. Rather, to push the emotional power of the story some direct focus called for. To get the right effect for the theatrical production, I recommend sitting on stage right. And I do recommend you see this. The script is good. The cast is very fine indeed. Worth your while. But I walked away thinking it would make an even better movie. 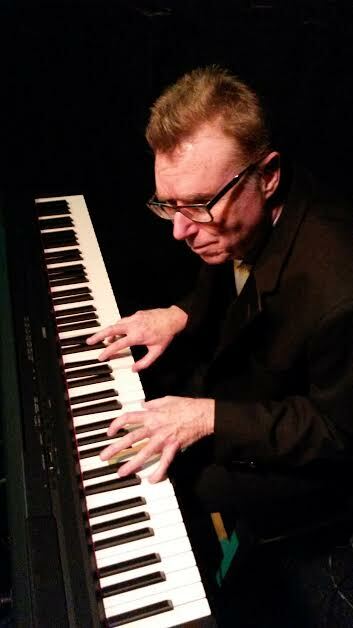 The Last Vig plays Saturdays and Mondays at 8pm and Sundays at 7pm through February 19, 2017 with two Friday shows February 10 & 17 at 8pm, at the Zephyr Theatre a 7456 Melrose Ave., Los Angeles, CA 90046 (between Fairfax and La Brea). Here it is--my first review of 2017. Something a tad offbeat--a musical performance titled after one of the best of several songs, End Up Here. 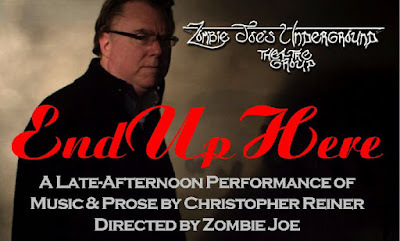 As some of you may or may not know Christopher Reiner has done quite a bit of original music for Zombie Joe's Underground Theatre Group in NoHo. Here, for about an hour, he shares a variety of songs. Music being as subject to taste as it is, let me be as clear as I can. First, I liked this performance very much. The music itself was very nice, nothing spectacular but good, and punctuated by a lyrics laden with dry wit. Here, more than the nice tunes and good delivery (with a definite glitter in Reiner's eye) the songs well and truly shine. It is hard to describe precisely why I'm so enthusiastic about this--and hard to warn anyone who might not find it their cup of tea. Yeah, I'm a fan of dry, preferably razor-sharp wit. Especially when not aimed at someone who doesn't deserve it, but rather at the self. There's the totally un-self-conscious manner Reiner has as a performer while doing his own songs. Also, I liked his digressions into stories about life in general. They aren't very many but make up a nice punctuation and/or cleansing of the palate. More, they share the same quality as the lyrics. Neither gives us answers, just stories--histories as it were from which we make what we can. Some folks don't like that. They prefer to be told explicit lessons. But Reiner gives us something else. Something I found quite enthralling in its own way. I suppose the best, most visceral comment I can make is to note my reaction as the show came to its close. It was only an hour, but as it ended I felt startled. Surely that wasn't an hour? Surely it was more like twenty five minutes? Nope. An hour. I left wanting more. If this sounds enticing, please hurry. 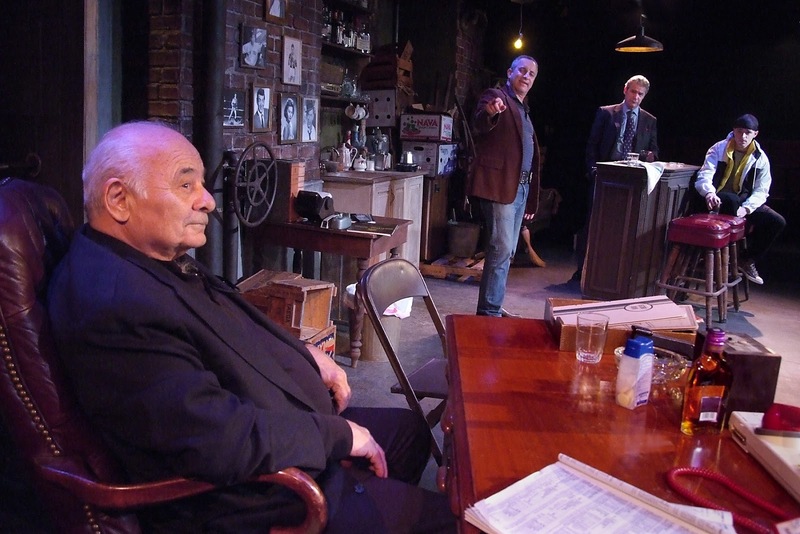 Only two performances remain as of this writing. End Up Here plays Sundays at 4pm January 14 and 22, 2017 at ZJU 4850 Lankershim Blvd., (just north of Camarillo, just south of the NoHo Sign) North Hollywood, CA 91601.